According to the U.S. Bureau of Labor Statistics (BLS), via its September 26th CES Preliminary Benchmark Announcement, the number of Private Sector Jobs reported in March 2013 was overstated by 136,000, and the number of Government jobs was understated by 12,000. But not to be outdone by a deteriorating economic reality, the BLS eliminated this bad news through a major change in its reporting methodology. After the change, instead of an overstatement of 124,000 nonfarm jobs (-136,000 + 12,000), the BLS will instead be reporting a net gain of 345,000 jobs on its January 2014 employment situation report. 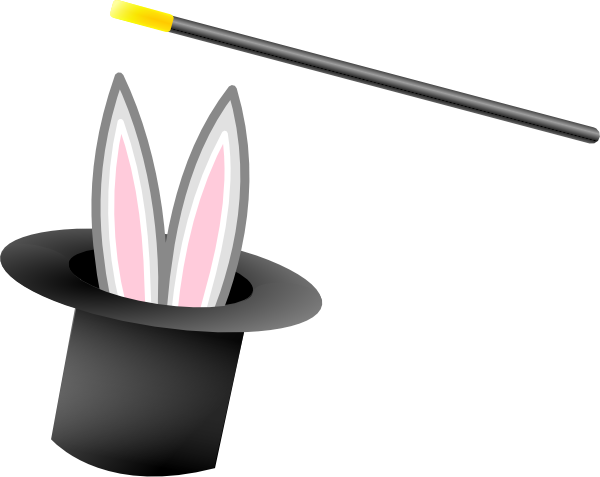 It’s magic! Here’s what the BLS said (emphasis mine), followed by the translation in plain English. What this means in plain English is that the BLS has once again changed the rules of the game, this time adding an estimated 469,000 Private Household Employees to its accounting of private sector jobs. So what’s wrong with that? Aren’t private household employees considered part of the private sector? The answer is no. Private household employees have never before been considered part of the private sector. The main reasons they have not been are as follows: (1) the BLS has no way of knowing how many household employees really exist, (2) no idea how many are considered full-time, part-time or temporary, and (3) will have virtually no way of tracking changes in the number of such employees on a monthly basis (i.e. its reports are issued monthly). Unlike private sector businesses, which are surveyed monthly and file quarterly employment reports, private households are not surveyed in the same manner and only file employment reports on an annual basis. According to the Internal Revenue Service (IRS), although household employees are most commonly associated with child care providers, such as nannies, private household employees also include service providers such as gardeners, cleaning personnel or maids, babysitters, housekeepers, private nurses or home health aids and drivers or chauffeurs. Since such employees have never been included in private sector reporting in the past, the federal government’s employment statistics after January 2014 will be forever inconsistent with every prior period. 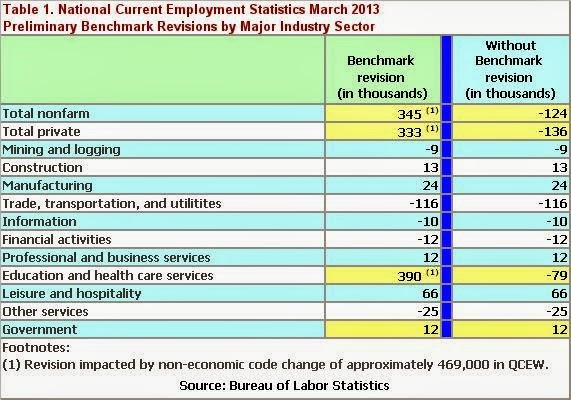 The table above, courtesy of the BLS, shows the March 2013 preliminary benchmark revisions by major industry sector. I have added a second column showing the changes without the addition of the newly concocted 469,000 private household employees. As you can clearly see, consistent with all prior CES statistics, there are actually 124,000 fewer nonfarm jobs than previously reported. The bottom line: The number of private sector jobs reported in March 2013 was overstated by 136,000. The number of government jobs reported for the same period was understated by 12,000. That’s reality. Those are the facts. Just like the Bureau of Economic Analysis has been overstating Gross Domestic Product due to changes in its reporting methodology, the BLS has been following suit. As the U.S. economy continues to crumble, aside from QE3, the only tool the federal government has left to combat this new reality is to lie through its teeth. Changing the rules midstream in order to paint a rosy economic scenario through phony statistical reporting is not only dishonest, but reprehensible. The problem with lying is that eventually reality catches up. When there are no longer any warning signs, yet the national economy collapses, who will you blame? Government Economic Reports: What You’ve Suspected but Were Afraid to Ask.